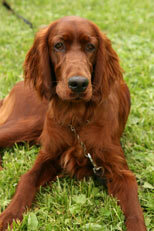 Irish Setters have a beautiful long, wavy coat. Irish Doodle puppies are likely to have a soft, wavy, non-shedding coat, and high native intelligence. The Irish Doodle isn't a breed as such, but a hybrid. A hybrid is a mix of more than one type of purebred dog whose parents are known. The Irish Doodle is a cross between an Irish Setter and a Poodle (usually a standard poodle), with the goal of obtaining the most desirable characteristics of each breed. The puppies that result from such a mix, sometimes called "Designer Dogs," are not a true dog breed and so are not recognized by the American Kennel Club (AKC) — but they are recognized by the American Canine Hybrid Club, which is the leading register for such designer dogs. With the Irish Doodle, the goal is to produce a litter of puppies with the friendliess and happy-go-lucky nature of an Irish Setter, combined with the non-shedding coat of the poodle. The Irish Setter and Poodle are both very intelligent breeds, so puppies from a setter father and poodle mother, or vice versa, should have significant native intelligence. Both breeds are also naturally clean and easy to housetrain, another advantage for the Irish Doodle pup. Poodles usually want nothing more in life than to please their owners, so the poodle half of the Irish Doodle equation makes for an easily trainable dog. 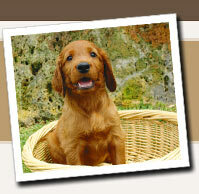 Irish Setters, on the other hand, can present a training challenge — they get bored quickly and are easily distracted. Setters can be well-trained, however, but they may require more patience and commitment by the human trainer than a poodle. There's no way to predict how trainable an Irish Doodle will be. The high native intelligent common to both breeds almost guarantees that once your dog is trained, he will be one of the best-trained dogs in your neighborhood. Irish Setters tend to be high-energy dogs, and Irish Doodle puppies are likely to need a lot of attention and exercise until they're well along in years. Standard poodles tend to be more laid-back than Irish Setters, so a pup that inherits that trait from its poodle parent may be satisfied with a little less running and playing than one that takes after its Setter parent. 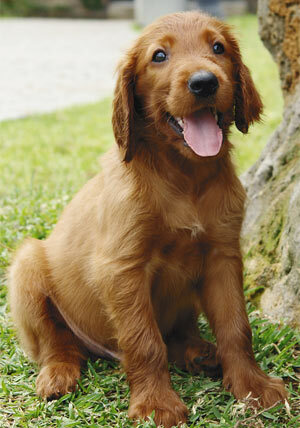 Puppies produced by an Irish Setter and a Standard Poodle are likely to reach about 50 to 70 lbs. as adult dogs. They will probably be at least 24" at the withers (shoulders) and could be taller. The poodle is a popular breed for use in creating hybrid dogs, because the poodle does not shed — thus, it has a perfect coat for people with dog allergies, and it is easier to keep your home free of dog fur. Studies of hybrid mixes and their coats revealed that when the poodle is bred with any soft-coated long-haired breed (such as an Irish Setter), the result is almost invariably a shaggy, wavy coat with very little shedding. Many believe that Irish Doodles and other designer dog hybrids benefit from a concept known as "hybrid vigor," in which the gene pool mixture of more than one breed can result in dogs that are more resistant to many of the birth defects and genetic predispositions of purebreds, such as hip dysplasia, deafness, or blindness.